The theme of the hearing was clear: Thou Shall Not Kill and these weapons will end life as we know it. 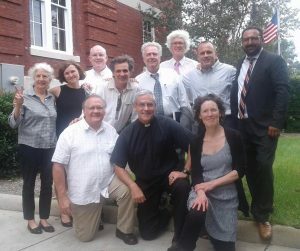 Speaking to the court were Mark Colville, Stephen Kelly SJ, Anna Lellelid, Stephanie McDonald, Patrick O’Neill, Bill Quigley, and Carmen Trotta. Everyone who wanted to speak was given several opportunities to speak and truth was proclaimed. The arguments were greatly assisted by sworn statements from Professor Francis Boyle, Physicians for Social Responsibility Director Jeff Carter, Catholic Bishop Thomas Gumbleton, and US Navy Captain Thomas Rogers. The first argument was that Trident nuclear weapons are illegal under U.S. domestic law. The weapons on one of the several Kings Bay submarines have destructive power hundreds of times more powerful than the nuclear weapons dropped on Hiroshima or Nagasaki. Any use or threat of use violates U.S. criminal law prohibiting war crimes, violates the laws of war, and violates the legal requirements of the U.S. Naval, Air Force and Army command manuals. These death machines cannot possibly be targeted to destroy only military targets so any launch will destroy tens if not hundreds of thousands of civilians within minutes and millions more in the nuclear winter aftermath. As Camen Trotta pointed out, these weapons of mass destruction are not only illegal once launched, but like regular weapons, the threat of their use is of itself illegal as well. Second, these weapons of mass destruction are illegal under U.S./international law. The U.S. constitution specifically incorporates international treaty law into U.S. law and international treaties prohibit the use of weapons which will kill civilians. The Naval Command manual also requires ship captains to follow international law. Third, the property protecting these illegal weapons, which was damaged in the symbolic disarmament, is not deserving of legal protection. Much like the pesticides used to murder millions under the Nazis, these weapons only use is illegal and immoral and the fences which protect them are likewise illegal. Fourth, the fact that government chooses only to prosecute those who seek to disarm nuclear weapons while turning a blind eye to presidential threats to use these illegal weapons demonstrates this prosecution is selective and vindictive. Fifth, because the government charged people with two counts of felony damage to property and conspiracy to damage property, some of these charges must be dismissed because they allow the government to criminalize the same conduct several ways. Sixth, the prosecution violates the Religious Freedom Restoration Act. Under this law, the government cannot interfere with religious faith or practices unless the government proves there is a compelling interest in doing so and the government proves that they have chosen the least restrictive way of doing it. Defendants pointed out that the government charged them to the maximum extent of the law when they could have sued them civilly or put them in diversion or taken less punitive action. The hearing also discussed discovery requests by the defendants and the government especially about how much it actually cost the government to replace the lock on the fence, repair the fence and clean and repaint the places on the base where defendants wrote biblical and peace statements. The Magistrate also heard objections to the electronic monitoring shackles which each of the people not in jail are required to wear 24/7. The Court promised to rule soon. Any ruling on the Motion to Dismiss will be a recommendation to U.S. District Court Judge Lisa Godbey Wood who will make the ultimate decision in the coming weeks. No trial date has yet been set. Assistant U.S. Attorney Karl Knoche said the Kings Bay Plowshares defendants and others in their cause created a “cottage industry” of breaking into and vandalizing nuclear U.S. military installations over the past 38 years, and then trying to use the subsequent prosecutions to get the United States to denuclearize. Indeed, two of the Plowshares defendants were involved in federal appellate court decisions referred to by both the prosecution and the defense during Thursday’s motions hearing in U.S. District Court in Brunswick. But the defendants had not before used the Religious Freedom Restoration Act as a defense, creating the possibility of the case to plow new ground on the extent of protections afforded by the federal government for religious exercise. Bill Quigley, who represents defendant Elizabeth McAlister and is a law professor at Loyola University New Orleans, said the two standards RFRA sets up are the government’s compelling interest and to carry out that interest in the least-restrictive way possible. He said he was willing to argue on the compelling interest point, but allowed a stipulation that the federal government has a good reason to deter people from gaining access to a Navy base that houses nuclear weapons. However, Quigley said the Justice Department violated RFRA by immediately going to a criminal prosecution, instead of seeking a civil penalty or pretrial diversion. Quigley also spoke at length about the defendants’ assertion that the United States is in violation of its own laws, international laws and treaty obligations by possessing nuclear weapons, which he argued would render the prosecution moot. By being indiscriminate and genocidal by nature, Quigley said, nuclear weapons are a war crime unto themselves. He also voiced disagreement with a U.S. 9th Circuit Court of Appeals ruling in a similar matter and holding that use of nuclear weapons may indeed be a war crime, but their possession is not. Carmen Trotta, who is representing himself, told the court threatening to use nuclear missiles — as President Donald Trump did in tweets referencing North Korea — is in itself a use of the weapons, same as pointing a gun at someone is considered use of a gun and a crime. The language used by defense attorneys and defendants at the hearing indicate they are preparing for and intend to take the matter to a jury trial, something that rarely occurs in federal criminal matters. Magistrate Judge Stan Baker said he would take the arguments into consideration. A ruling on the defendants’ motions to dismiss is expected in the next coming days.